At the Nuremburg trials in 1945 the Nazi criminal Hermann Goering tried to make a joke about the nations involved in the Second World War: Take one Englishman, he said, and you have an idiot. Two Englishmen - a club. Three Englishmen - and you have an empire. Take one Italian and you have a fine tenor. Two Italians - a retreat. Three Italians - unconditional surrender. What would he have said about the Chechens? What happens if you take three Chechens? Nothing at all, because they won’t agree to meet. And if they do meet, they will not agree. And yet our tradition of mutual help and support is very strong! Not many peoples have a wonderful tradition like the Chechen belkhi, when a house is built or some other difficult task performed with communal effort and voluntary labour. Chechens will share their last crust of bread with each other. Chechen men stand shoulder to shoulder in every conflict, always ready to risk their lives to defend the honour of all. But if there is no belkhi or utter destitution or mortal peril, if Chechens are just sitting round a table to negotiate and take a unanimous decision and implement it – then there is a problem. Usually what happens is that each man sticks to his own opinion and starts a war of his own. I once spent a month in a European capital. In the city live hundreds, even thousands of Chechens. And all of them together are incapable of properly maintaining and developing a single Chechen cultural centre. They can’t even collect ten euros from each Chechen to pay the rent. Many of our compatriots living abroad are not rich, that is understood. But ten euros is not very much – it’s four trips on the metro. That a cultural centre exists is due to the enthusiasm of a local human rights defender who is not a Chechen at all. Sometimes he asks a rhetorical question like: so you Chechens want to have a state of your own – but if you can’t even agree among yourselves to maintain a small cultural centre, how will you manage a whole state? The question remains unanswered. 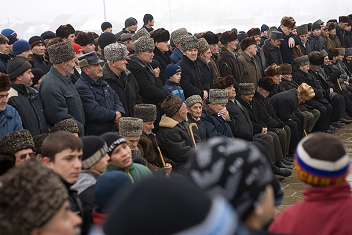 The Chechen diaspora is divided in its political preferences, each party agrees to participate in the institutions only on condition that they accept their programme, which, however, none of them have. A year has passed, and the centre’s statutes have not yet been written. There is an old saying that a nation which does not want to feed its own army will end up feeding someone else’s. The same can be said about its government: a nation that refuses to obey its own government will be forced to submit to another. Such a nation will be conquered and incorporated into another country. And part of it will be forced to emigrate and, once again, be subject to foreign governments in foreign countries. The Chechens are a freedom-loving people, that is true. Each person has his own sovereignty and recognizes no authority above him except the power of God. That is very romantic. But not very practical. To be frank, the Chechen state of "Ichkeria" had little chance of survival. In the aggressive environment of Russia's presence in the Caucasus, that chance grew more slender with each passing month, until it came to nothing. But still, it was still a valuable historical experience which once again showed the importance of the uniting factor in forming a nation. The lesson was a negative one, alas. The Chechen people elected their president, Aslan Maskhadov, deliberately and by legal means. They did not only vote for Maskhadov himself, but also for his programme, which was a peace-loving and creative one. The Chechen people also had a choice, in the person of another candidate – Shamil Basayev, with his aggressive and clerical programme. But Basayev lost. The nation made its choice! However, the people did not unite as a single state. Everyone continued their own private war. Everyone tried to introduce their own policies. There was no consolidation. Later Basayev, as he had wanted from the first, carried out an invasion of the territory next door. Who gave him that mandate? Didn’t the Chechen people, by voting against his candidacy, reject this programme? Indeed they did, but a minority failed to comply. Everyone remained sovereign to themselves, as if there had never been any presidential elections. The people’s democratic choice will not necessarily be in favour of "Western values". A majority of the nation may choose to live according to other principles, such as Sharia Law, and in that case the result of the choice will be a democratic one. But democratic self-determination has its limitations. On the one hand, there are human rights, on the other, the rights of other peoples and nations. One cannot “democratically” decide to cut out all minorities – redhaired people, say, or “infidels”. People have the right to life and personal freedom of choice, otherwise the “democracy” is worthless. If a citizen does not share the values of his country and finds it impossible to exist within the established guidelines, he should at least be allowed, freely and without prejudice, to change his nationality and place of residence. The second aspect is international. A nation does not exist in a vacuum, but is surrounded by other peoples and nations, and if the nation wants to be respected and left alone it must also make the choice that its neighbours have made. Even if they have chosen a different path of development – that is their right. And no one has a right to impose their way of life by force. Although these are obvious, simple truths, we constantly forget them. Or even reject them as being "Western". But the truth is not Western or Eastern. The truth is always the same. Nations need a state of their own, and the power of the state must be established by the exercise of free will, not by force. A necessary condition of one’s own freedom is respect for the freedom of other people and nations.